Check out Mr Ben and our sweet Children's Garden on Issue TV! "There are many things children can learn from gardening, including an appreciation of where and how foods grow to their impact on the environment. In Austin, this is a great time to get started with involving your children in your gardening plans. 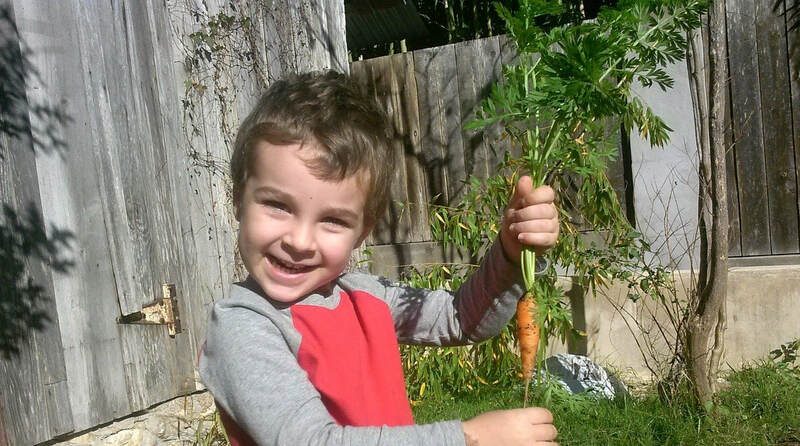 Ben Harnden, the co-founder of Austin Children’s Garden, which is a nature-based preschool with organic gardening and healthy cooking as integral parts of the education, sees a lot of benefits for youth who garden. “We see improved mood, less conflict between the children, and more cooperative behavior when the children are outside and engaged in meaningful activity,” he says. Harnden also believes gardening can help children with math. For instance, he said to have them count the number of plants and measure the space between plants, which gives them a practical approach to math. They can also gain science skills as they learn about life cycles and seasons of the year, including understanding the patterns of the sun. They can learn language arts skills by using both English and Latin to identify plants. They can also learn art skills by making collages and other craft projects. For more information on children's gardening programs, visit Zilker Botanical Garden at www.zilkergarden.org or Xerscaping in Austin at www.xeriscapinginaustin.com."